Of course, if you follow this blog and my social media posts, you know that the book has been out for ten days already (on IndyPlanet.com and Amazon.com). Hopefully you’ve already purchased, read and enjoyed it. If you haven’t, today’s blog post is especially for you. 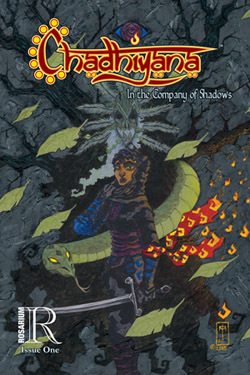 Chadhiyana: In the Company of Shadows is a graphic novel written and illustrated by yours truly (J. M. DeSantis). 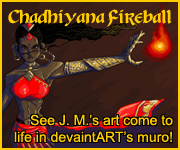 It is the third published story in the Chadhiyana series, a medieval Indian fantasy series which I began working on in late 2011 (the first two short stories appeared in Chadhiyana #0; which you can still purchase for a limited time on IndyPlanet.com: indyplanet.com/front/product/87263/). Though the third story in the series, In the Company of Shadows is set before the events of the first two stories. 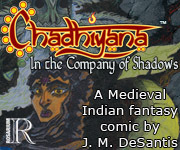 The graphic novel originally published in weekly installments on chadhiyana.com until it was picked up earlier this year by Rosarium Publishing (rosariumpublishing.com) for serialisation as a bi-monthly comic. So far the book has garnered positive reviews from Blerds Online (blerdsonline.com/2015/07/comic-review-chadhiyana-1.html) and Comic Books for Colored Folks (darkjeedai.blogspot.com/2015/05/chadhiyana-in-company-of-shadows.html) and is currently available to purchase on both IndyPlanet.com (indyplanet.com/front/product/124832/) and Amazon.com (amazon.com/Chadhiyana-Company-Shadows-JM-DeSantis-ebook/dp/B00Z4M2DKY/). Comixology and PeepGameComix.com are forthcoming (the sites have approved, but not yet listed the first issue). Announcements will be made for those as they become available. So, for those who are new to Chadhiyana, I hope you’ll pick up a copy of Chadhiyana #1 and start reading her story. I know I’m a little biased, but I promise you won’t be disappointed, especially if you’re looking for something fresh with a female protagonist, to add to it. For those who are familiar with the Chadhiyana and were reading the book when it was publishing on chadhiyana.com, I hope you’ll show your support and pick up a print or digital copy of the book. It’ll be a good refresher anyway, as there’s still a lot to come in this series. I keep promising that, and I hope you’ll come to agree in time that I made good on that promise.